Sunday I went to Target. Other than stopping for cold remedies, this was the first foray out since being attacked by this cold. The list contained things like a new ironing board cover, brown sugar, cough drops (which are over a $1.00 less at Target than at Dominicks) and Scotch tape. I decided also, to treat myself to a box of Pop Tarts, hardly a nutritional gold mine, but they were something I just craved. The thing that is somewhat attractive about Target is that they have unadvertised specials throughout the store. The tape I bought was a 3 pack for $3.00. It's the "gift wrap" tape, the kind that supposedly becomes "invisible" on the package. The regular tape was $2.40 but when I compared the amount I got, I'm getting almost 1.5 times more in the 3 pack. That's a better value. 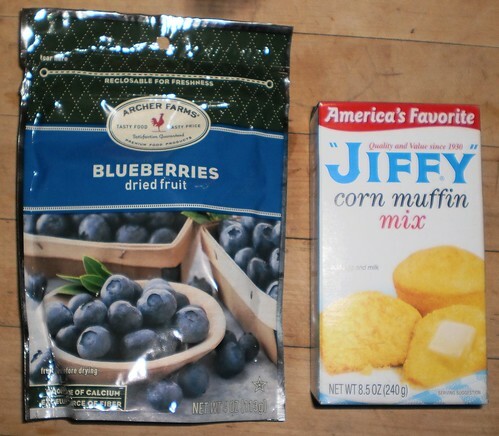 As I'm walking through the baking aisle to get to the brown sugar, I pass by the Jiffy muffin section. An unannounced sale has boxes of corn muffin mix for 49 cents. 49 cents. You add an egg and a third of a cup of milk and you have muffins or cornbread for less than a dollar. Yes, I have cornmeal at home but, at this price, the cost of cornmeal, sugar, melted butter, egg and milk is probably comparable to a box that whips up faster. I decided to add a package of dried blueberries which was quite a bit more than 49 cents. I made the cornbread last night and it is wonderful. The blueberries add just the right sweetness. I didn't use the entire package so I will be adding blueberries to my usual Saturday oatmeal. It was a rainy night last night and the chill makes my knees hurt more. Sitting down to munch on warm blueberry cornbread made the night very pleasant. 49 cents. That's happiness.